Crowds of people seeking a miracle cure for wrinkles have been queuing up to get their hands on new stocks of a hugely popular anti-ageing cream. 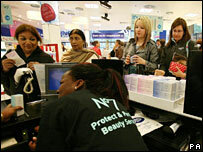 Several of Boots' flagship stores opened at 7am to cope with the massive demand for its No. 7 Protect & Perfect Beauty Serum. The cream sold out after it was featured on a BBC2 Horizon programme. Richard Baker, chief executive of Alliance Boots, it had taken three weeks to get the product back on sale. Stocks sold out following the television broadcast in March, and 50,000 British women have since signed up to waiting lists for the cream. The cream is Boots' fastest selling product ever and its production facilities have been working around the clock to reach targets of 24,000 bottles per day. Some 200,000 extra bottles of the lotion have been sent to stores across the UK. Eager shoppers were found queuing up at the Boots shops in Oxford Street, London, Market Street in Manchester, Lower Parliament Street in Nottingham and Princes Street in Edinburgh which all opened early. A one-per-customer policy is in force but dozens of bottles have still been advertised on auction website eBay, with prices as high as £75 pounds for the 30 ml container, compared with the price of £17.25 in London and £16.75 outside London. Mr Baker, chief executive of Alliance Boots, said: "We're absolutely delighted. It's taken us about three weeks to get the product back into supply. "I think we will probably sell what we've made over the last three weeks this weekend. "We will continue manufacturing it as rapidly as we can and as soon as we've got some more product we will get it into our stores."